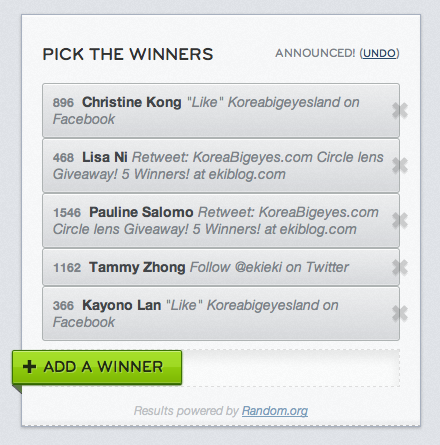 All the winner was randomly chosen by random.org. Here are the winner of the giveaways! I have forwarded your infos, a rep from Koreabigeye will contact you shortly! OMG i won the certificate!!!!! I've never won anything before I'm so happy :DD thank you Eki!! Hi Eki, I'm really really happy to have won the contact lens but I've been trying to contact Korea Big Eyes since receiving their last email confirming the giveaway. I'm worried my emails have gone into their spam folder or something else could have happened.